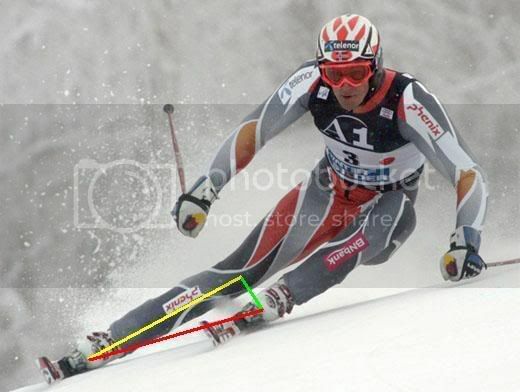 In coaching and ski instruction we often hear the instructions being given: "your stance is too wide," or "your stance is too narrow," or "modern technique requires a wide stance." We have all heard it, some may have even used it from time to time – but what are those seemingly informative statements really telling the athlete/individual – and are they actually misleading? Horizontal Separation: The distance between the legs as measured perpendicular to the tibia. 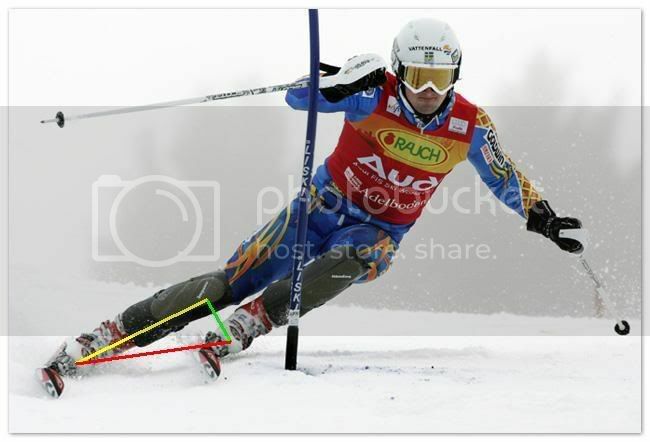 This distance will usually stay the same or shrink as the skier moves from the transition of the turn to the apex. Vertical Separation: The distance that the legs have separated from neutral (standing flat) at any given point during the turn. This distance is constantly changing (just like the vertical distance of your feet is always changing when you are riding a bike), and usually is greatest at the apex of the turn and least (zero) during the transition. Lack of vertical separation as a turn develops is often mistaken for having a stance that is too "narrow." In the two images below the yellow line represents vertical separation, and the green line represents horizontal separation. I have also illustrated the resultant component that dictates the width of the tracks that are going to be scribed in the turn. Remember, these components are defined in relation to the skier, not in relation to the ground. A good rule of thumb for both vertical and horizontal separation is that neither should ever be manipulated to be anything other than what is dictated by the shape and size of the turn. As soon as the skier starts to use too much or too little of either component they are going to affect how they are balanced in the turn. Always begin with a functional horizontal separation similar to the separation that you would use when walking or running. This is the distance that you will be most comfortable with and best balanced so it is a very good width to use as a starting point. Both horizontal and vertical separation will change as dictated by the turns being made as to not compromise the base of support. Transition types and timing of edge changes will also affect how much the horizontal separation changes between the apex and transition. Fast (forced) edge changes and high edge angles will often force a skier to maintain a slightly wider horizontal separation through the transition because they are spending so little time in it. The majority of the time is spent at high edge angles where horizontal separation is very small. Vertical separation is more difficult to teach because it is a direct function of the angle that your skis are tipped at. It is also a component that must be allowed to develop, but not forced or created. When either component is compromised, the base of support is also compromised, which will lead to ineffective balance and constantly fighting the turn that you are making. To ask questions and participate in a discussion on this article, go to our forums.